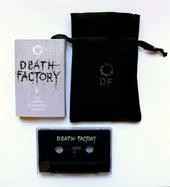 Limited edition (40 copies) C-30 in black satin screen printed bag, paper wraparound slipcase, polycase, and black screen printed tapes. A2 is a live excerpt of a set on WZRD 88.3fm in Chicago recorded (2-5-09)by Rick Martin. B1 is an excerpt of a live set on WNUR 89.3fm in Evenston ,IL. recorded ( 11-18-2008).